Whether you are an aspiring actor looking for fame in the next Hollywood blockbuster or simply a traveling tourist ready to admire a location that has become synonymous with the world’s iconic stars, Hollywood, California is one of those places that you are likely to have a love-hate relationship with. I am going to start by saying we thoroughly enjoyed our time in the heart of “Tinseltown” and look forward to returning again in the future. 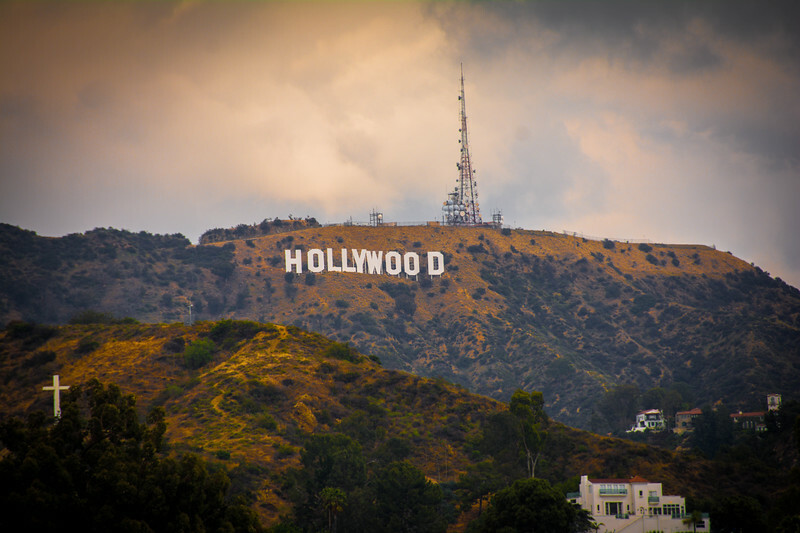 If you are intrigued to find out the best things to do in Hollywood, keep reading! Visitors to Hollywood will either immediately fall in love with the stardom associated with this place or perhaps wonder how on earth this location become such a popular hotspot for the world’s leading stars. 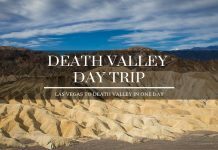 To quote Kevin Bacon, “Hollywood is more of an idea than a place” and although there may be some truth behind this, it’s one of those iconic US destinations that you simply have to visit at least once in your lifetime. From the best place to stay in Hollywood to all the best attractions along Hollywood Boulevard (and of course, the iconic Hollywood sign! ), we are going to share the ideal itinerary to spending 48 hours in this part of Los Angeles. If you are flying into LAX, we strongly recommend experiencing this part of the metropolis. 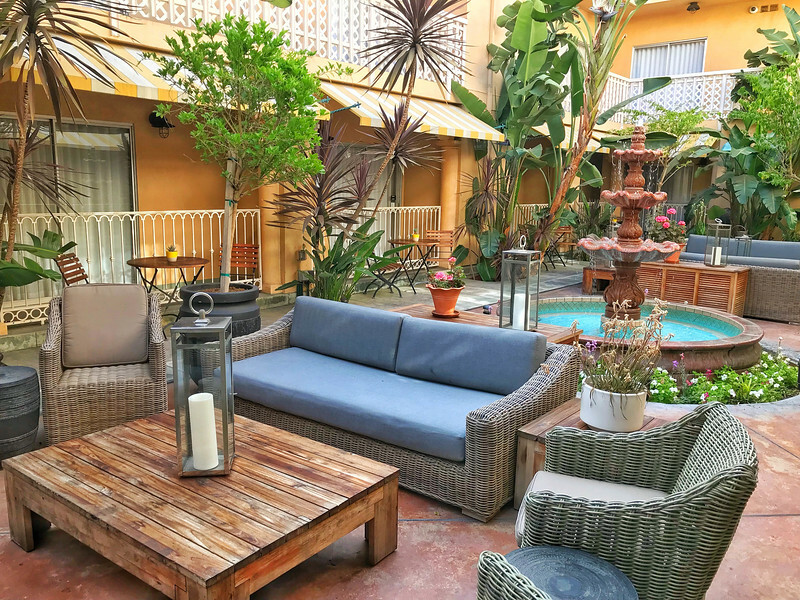 To get the real experience of life in Hollywood, you really need to find a hotel that gives you the opportunity to explore the heart and soul of this neighborhood. 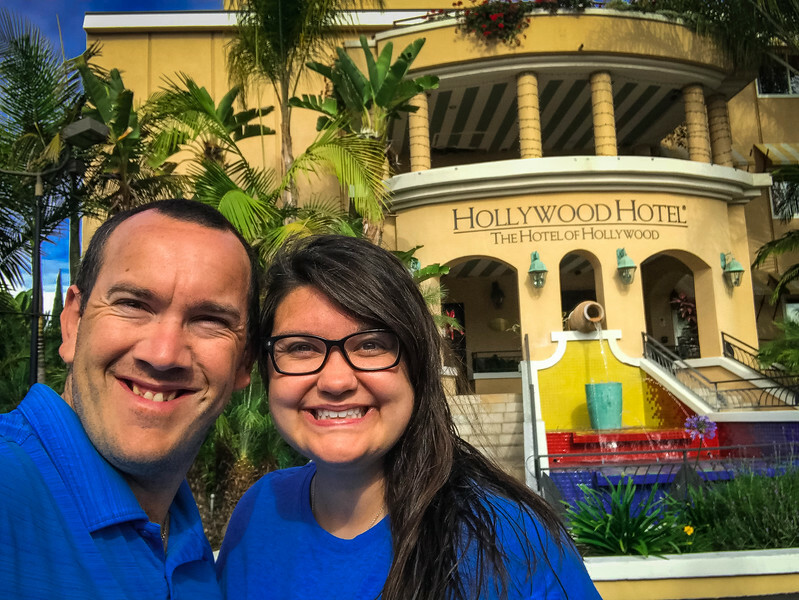 We can 100% attest that we found the perfect place – welcome to The Hotel of Hollywood, also known as Hollywood Hotel! 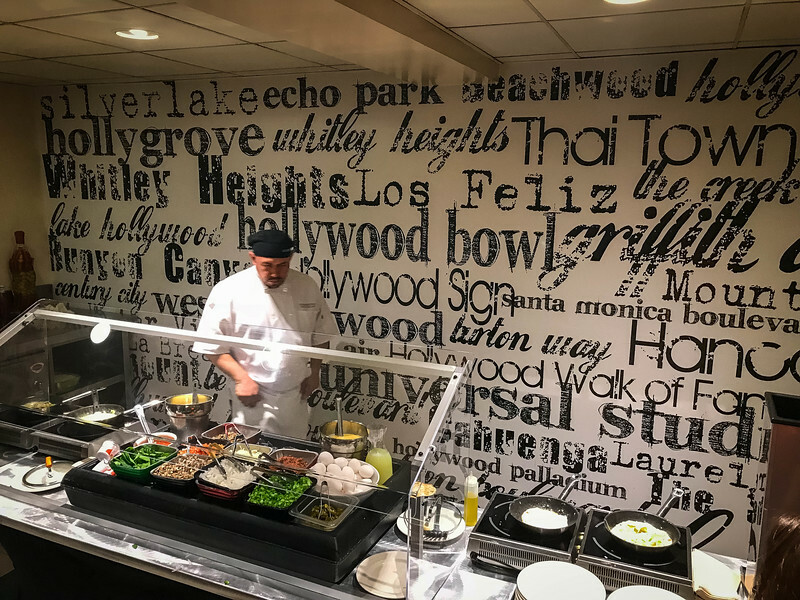 If you are looking for a luxury, boutique accommodation option while exploring “Tinseltown,” Hollywood Hotel is undoubtedly the perfect choice. 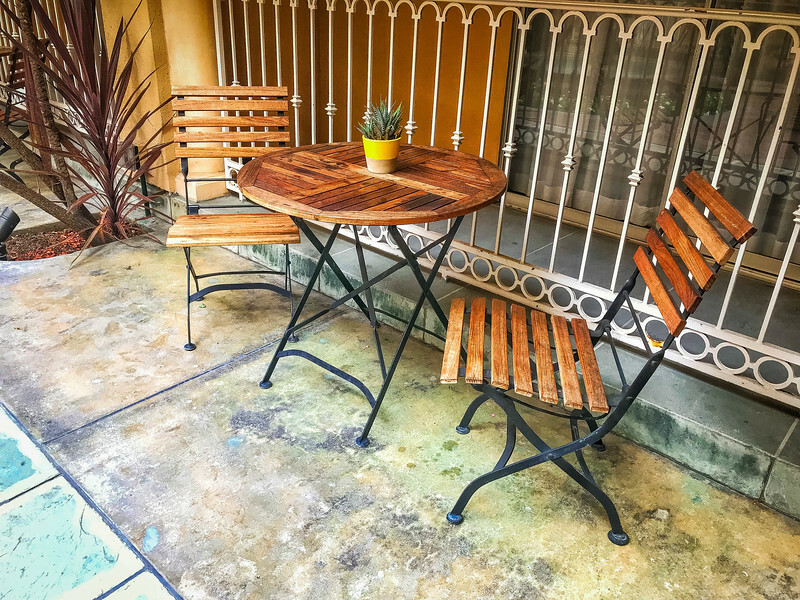 We always hear about “location, location, location” when it comes to properties and it’s fair to say this is the ideal spot to explore the very best of Hollywood. Anyone visiting Los Angeles for the first time will quickly realize that having a car is a hindrance rather than a benefit. 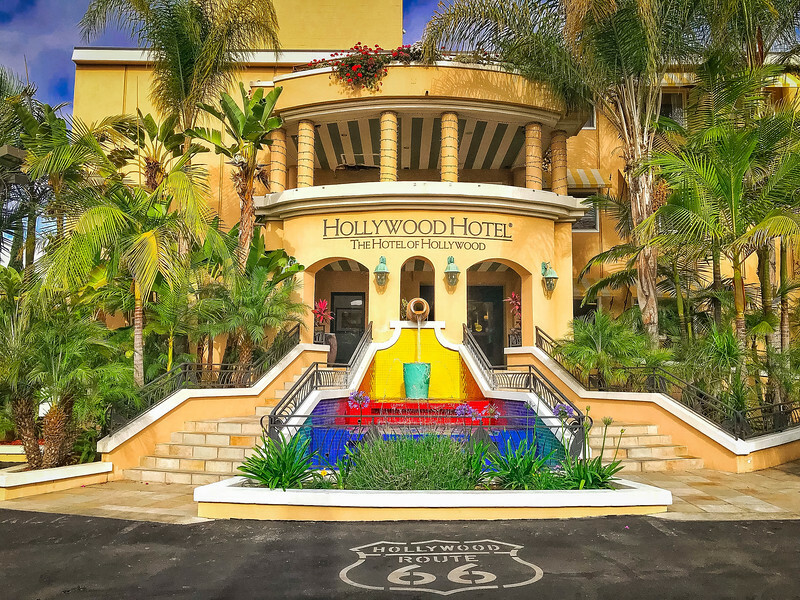 If you choose to rent a car, here is our tip…head to the Hollywood Hotel, park your vehicle and leave it there while you explore the best of the city! 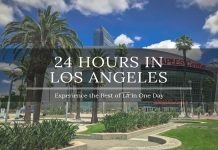 Take a 2-minute stroll across the street to the metro station, grab a one day (or multi-day if you are staying in the Los Angeles area for several days) pass for only $7 (that’s right, only $7 for UNLIMITED use throughout the day!!) and start exploring. From Hollywood to Santa Monica to downtown Los Angeles, the Metro is by far the best way to get around the city and surrounding neighborhoods. We have experienced public transportation in New York City, London, Paris, and Singapore but I think LA is definitely up there with some of the best around in terms of convenience, accessibility, ease of use and of course, price! 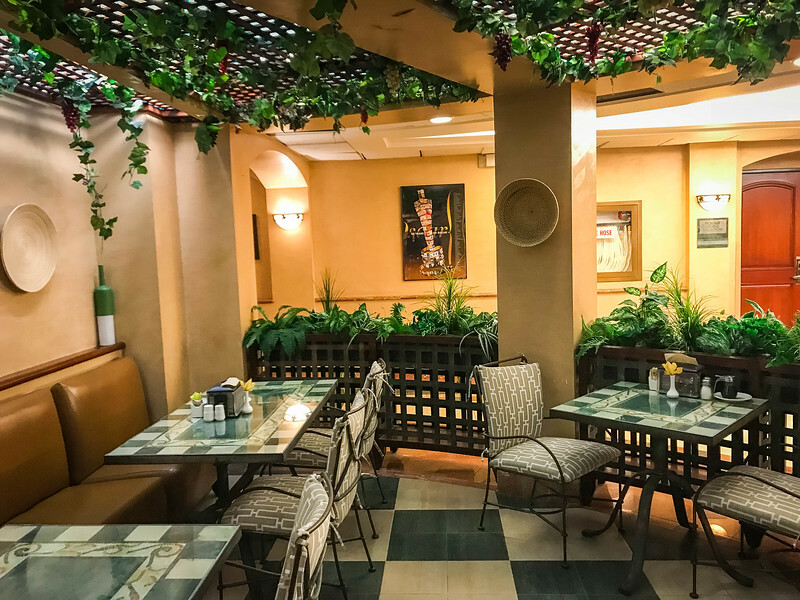 Meanwhile, when you head back to the hotel after a long day wandering around Hollywood, there will be a perfect environment awaiting you to enjoy a relaxing evening. 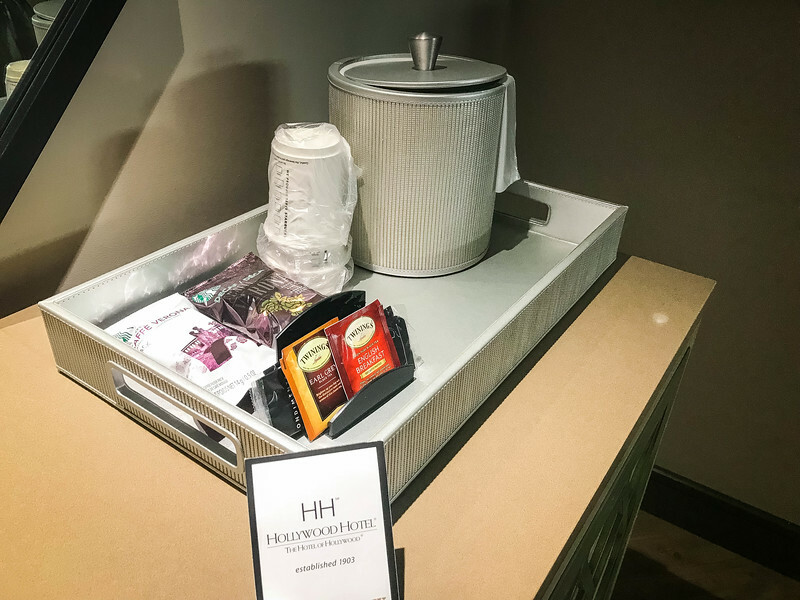 When I read that the Hollywood Hotel offered “contemporary accommodations” combined with “quintessential Hollywood glamour,” I knew that we were heading to the perfect place. 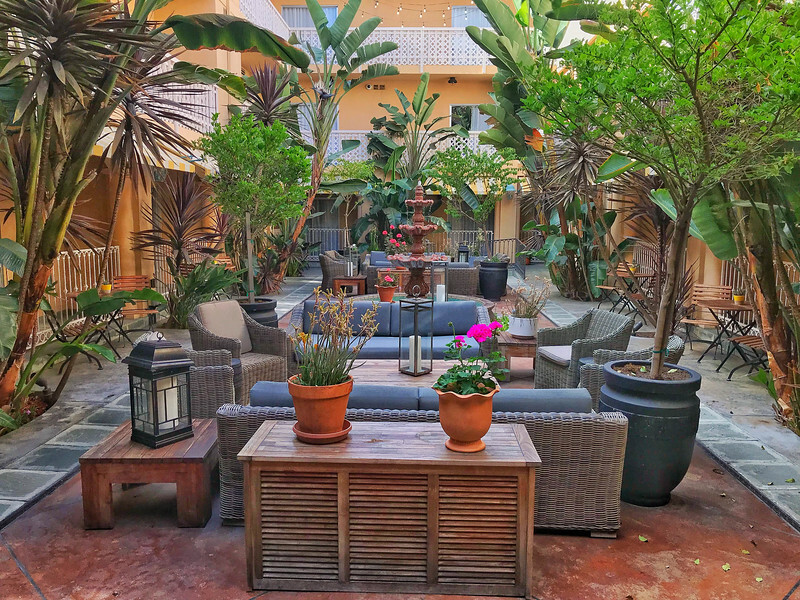 The courtyard in the heart of the hotel epitomizes the archetypal boutique establishment that is perfect for the Hollywood style we associate with the likes of Marilyn Monroe et al. Grab your favorite book and head outside to enjoy a relaxing ambiance as your thoughts drift away to contemplating life as a movie star back in the 1950s or 60s in Hollywood. 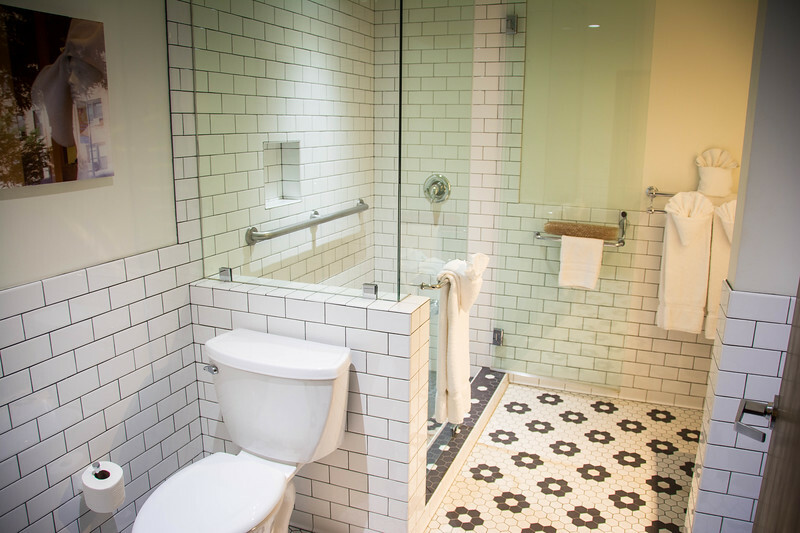 The Hollywood Hotel offers a distinctive range of guest rooms and suites to suit everyone’s needs. 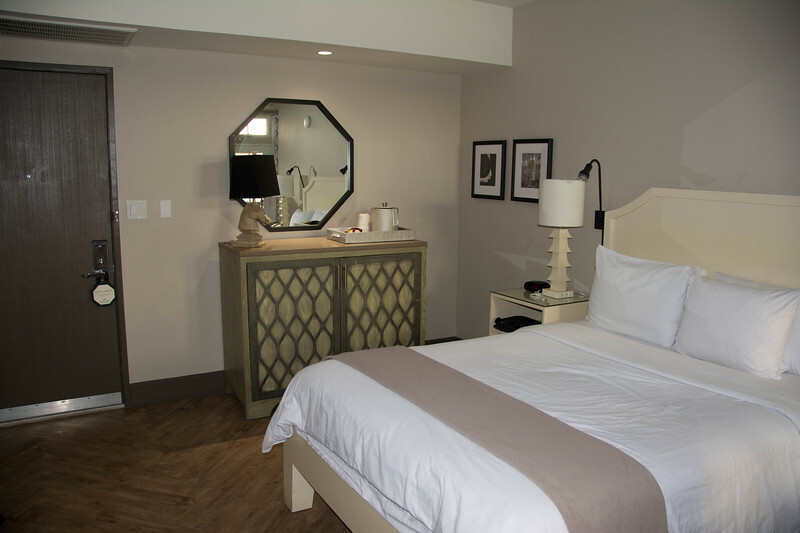 For those that prefer a more spacious option, consider the Junior Suite or Jacuzzi Suite, both of which offer something a little more in terms of luxury in comparison to the standard guest rooms. Don’t let this fool you though, the Luminary King guest room is where we stayed for two nights and was everything we could have wished for and more! 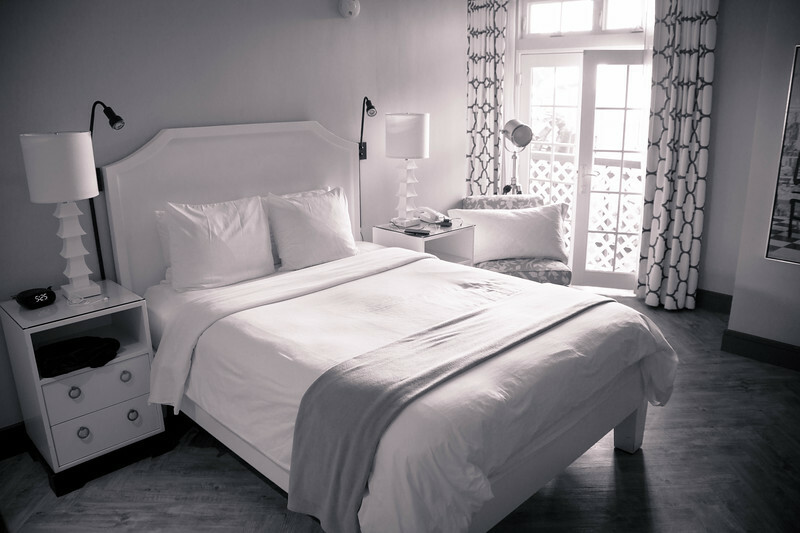 The decor throughout the room exemplifies the overall style and feel of the hotel. A crisp white finish throughout the spacious bathroom combined with the modern glass walk-in shower is the ideal environment to relax before venturing into the room and indulging yourself in the plush king-size platform bed. You can’t help but fall in love with these rooms and the hardest part of any stay at the Hollywood Hotel will be actually getting up in the morning because the beds are incredibly comfortable. 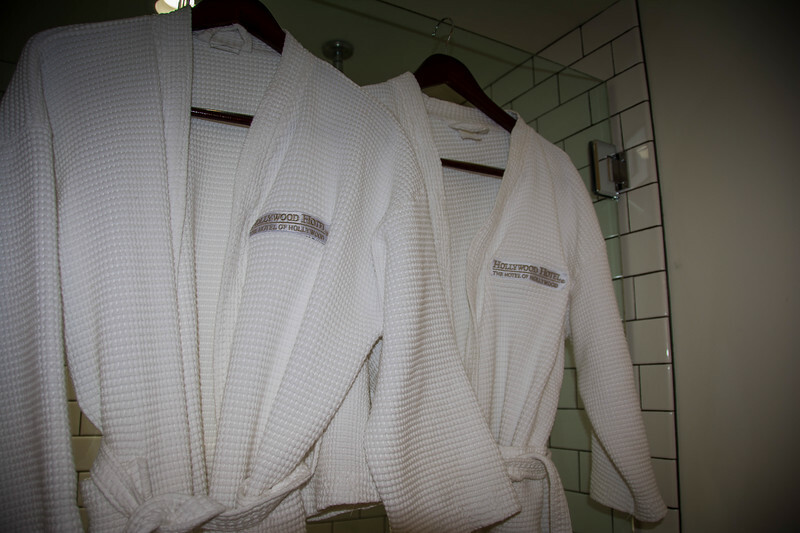 Amenities inside the room include a 37″ LCD TV, coffee/tea maker, microwave and of course, the pièce de résistance, stylish “his and hers” bathrobes with the Hollywood Hotel embossed on them! Can you think of any better way to start the day than with a hearty breakfast? 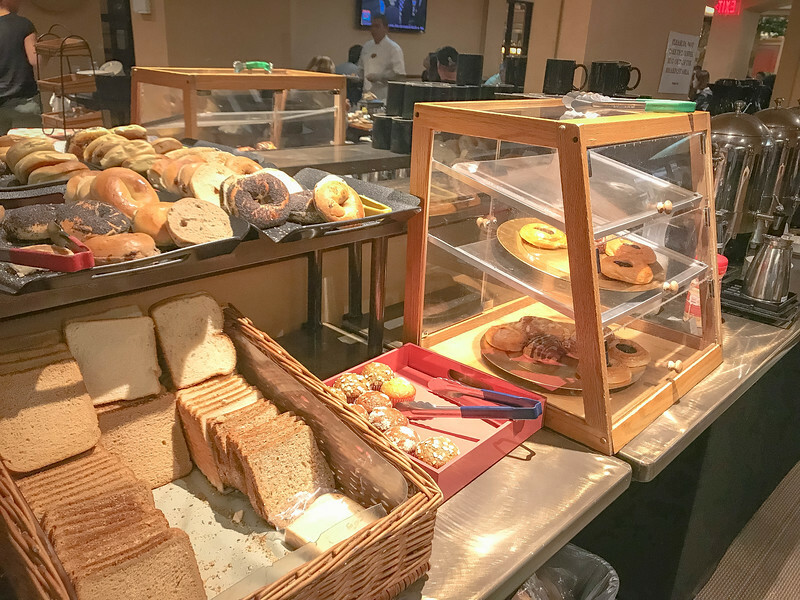 The complimentary breakfast buffet offers an eclectic blend of hot and cold delicacies, all of which combine to satisfy your appetite before heading out to explore everything Hollywood has to offer. Consider creating your very own customized omelet by the local chef or perhaps indulge in the variety of cold meats, cheese, and pastry items. Regardless of what you choose, you can be sure that you won’t leave hungry! Directly across from the breakfast area is Route 66 Bar and Lounge which is the perfect environment to mingle with friends and family while enjoying an aperitif or two. Be sure to check the schedule before your visit because you never know what live entertainment may be arranged inside the bar. You can also look forward to a daily “happy hour” between 5 PM and 7 PM either inside the bar or at the outdoor bar in the courtyard. 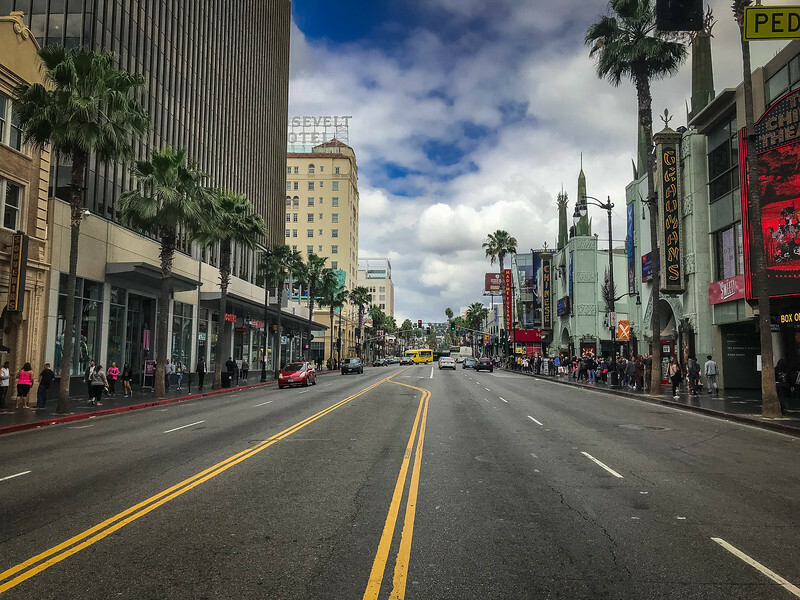 There is an undeniable appeal to Hollywood as you stroll along the Boulevard and hope to see one of your favorite movie stars. Sorry to dent your hopes folks but it’s highly unlikely unless you are planning a visit to a major movie premiere or awards ceremony at the infamous Dolby Theatre. Ok, enough of the negativity…don’t let the potential (or lack of) of seeing a movie star prevent you from exploring the best of Hollywood. 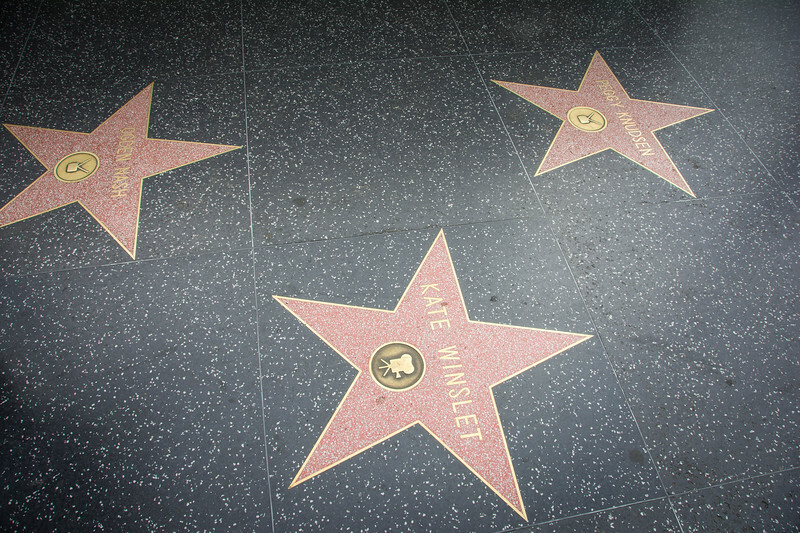 Take a stroll around the iconic Hollywood Walk of Fame and try and find your favorite movie star. 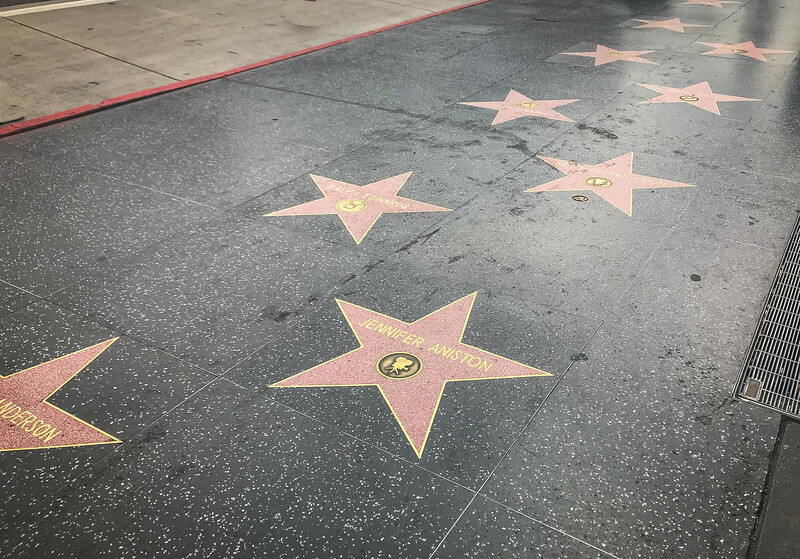 A word of caution, it may take a while because there are 2,600 stars (as of the time of this post being published in 2018) scattered around Hollywood! But this is certainly one of the coolest experiences because you never know which Hollywood “star” you will step on next. Who is your favorite movie star, musician or TV personality? 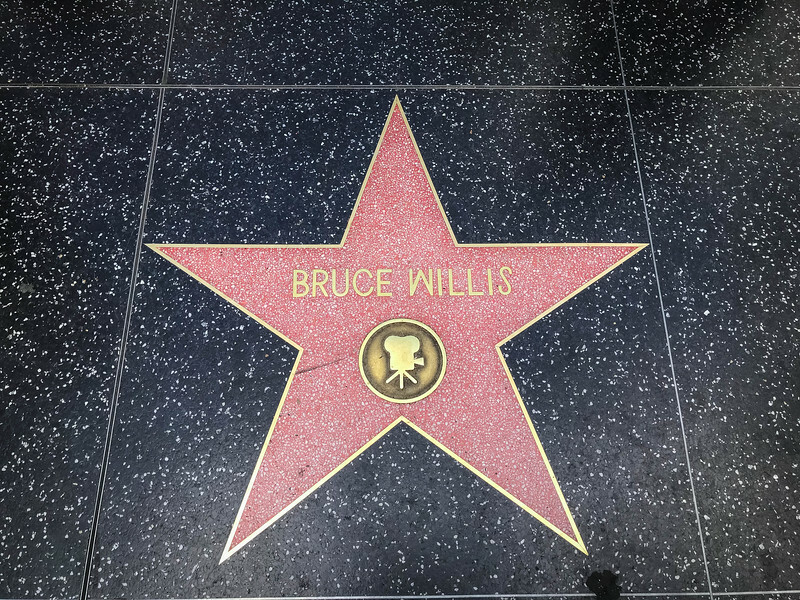 The Walk of Fame stretches 1.3 miles from east to west along Hollywood Boulevard, from Gower Street to La Brea Avenue along with 0.4 miles north to south on Vine Street between Yucca Street and Sunset Boulevard. 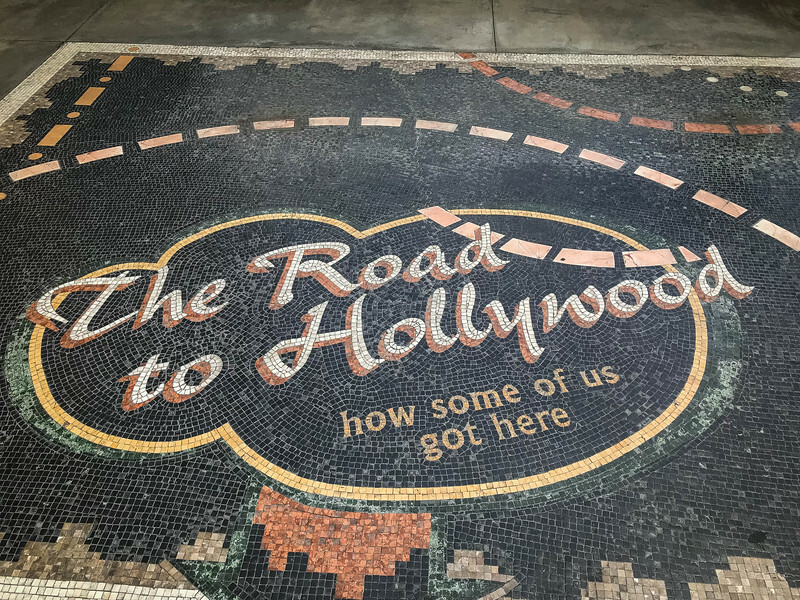 I think it’s fair to say that you could easily spend a couple of hours exploring this iconic “walk” to try and find your favorite stars but with so many other things to do in Hollywood, simply spotting a few of your favorites will likely be sufficient. 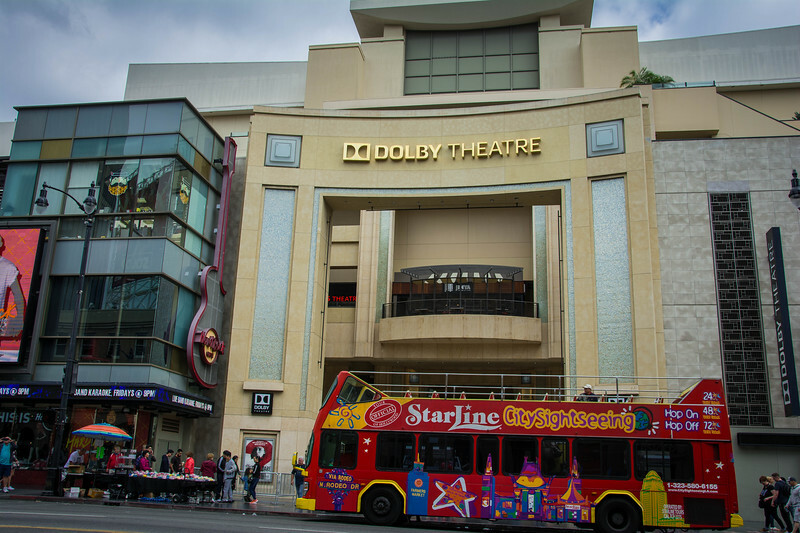 I haven’t figured out if there is any real structure or strategic organization to the Walk of Fame but there are several spots, such as in front of the Dolby Theater where many iconic stars can be found while other areas have less well-known individuals. 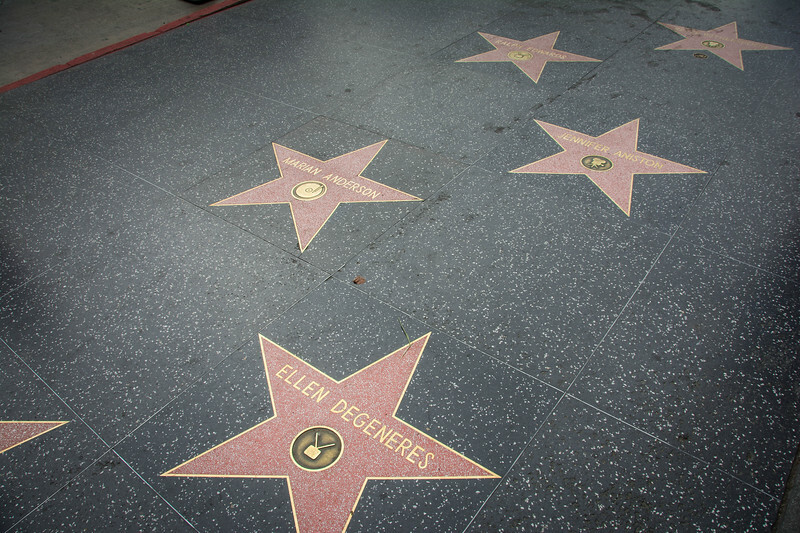 Did you know that it costs $40,000 to have a star on the Walk of Fame? Realistically, this amount isn’t going to break the banks of many of the folks on this stretch of sidewalk but it’s still a hefty amount when you see these in person. Unlike many symbolic attractions around the world, the Hollywood Sign is actually pretty challenging to visit. It’s not one of those places that you can see from everywhere or from any angle and to hike the Santa Monica Mountains in the Hollywood Hills area is far from easy, particularly given that much of the surrounding area is private property. But don’t let this challenge stop you from trying to catch a peek at this iconic spot. 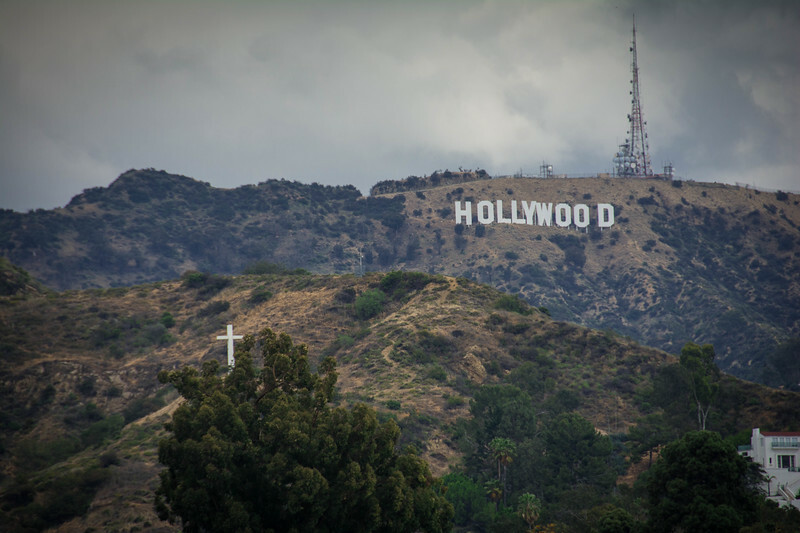 For those of you that don’t want to pay exorbitant fees to take a guided tour of the Hollywood Sign or simply don’t want to go to the effort of hiking around the Hollywood neighborhood to get an up close and personal viewpoint, there are several viewing spots around that are well worth visiting. 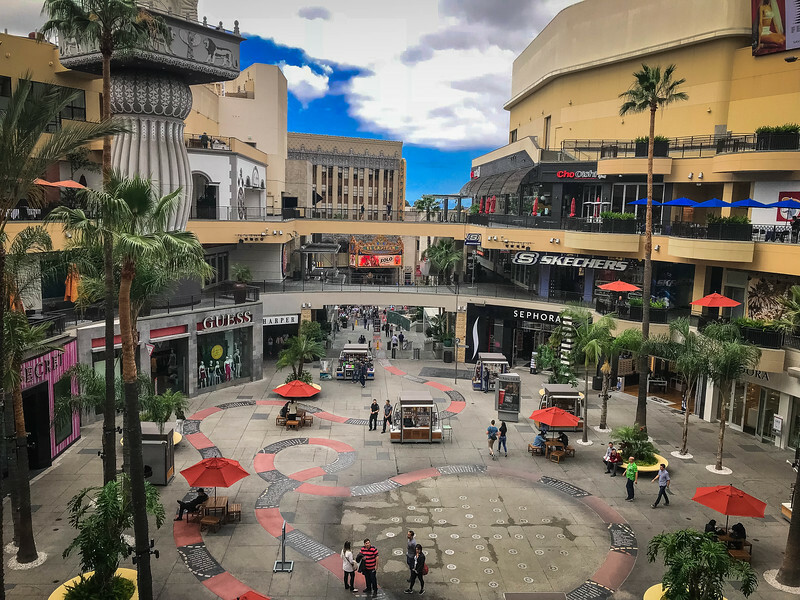 Our favorite spot is at the Hollywood and Highland Mall, a shopping and entertainment complex located along Hollywood Boulevard that offers an excellent viewing platform to admire the sign. Admittedly, you are a fair distance from the sign and it would serve you well to have a pretty solid telephoto zoom lens to capture cool shots but this is definitely a great, “easy” option. What you won’t really appreciate from the viewing platform at the mall is the size and magnitude of this sign. The word “Hollywood” is spelled out in 44-foot tall capital letters and date back to 1923 when this sign was first constructed. 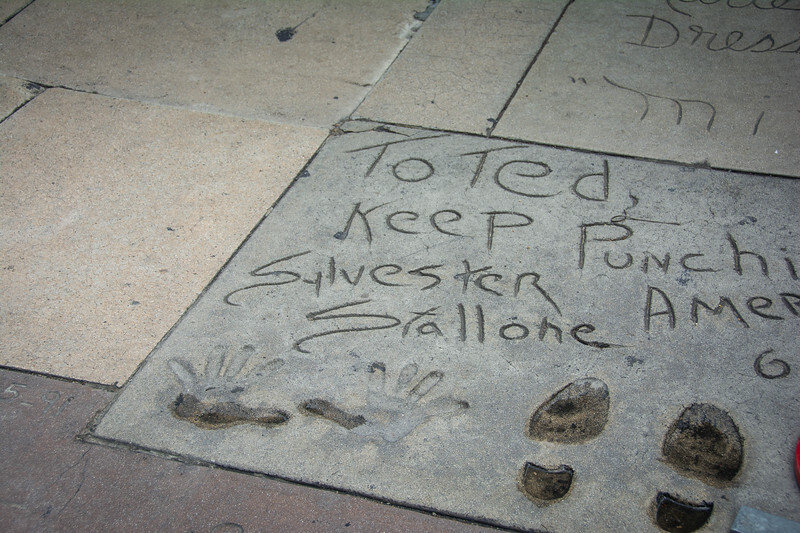 One of the coolest experiences around Hollywood is to visit the TCL Chinese Theatre to check out the collection of hand and footprints of famous movie stars that once stood there. Although the thought of visiting a location simply to see a bunch of hand/footprints may be a little crazy, the moment you arrive here you will be star-struck and immediately will be comparing your hands and feet with your favorite stars. 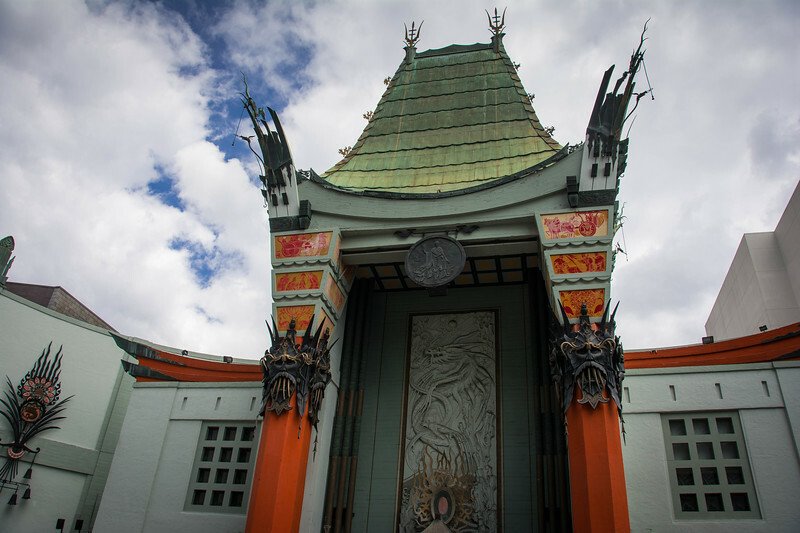 The TCL Chinese Theatre is renowned as one of Hollywood’s most beautiful and well-preserved theatres from the “Golden Era.” Both the exterior and interior are impressive and certainly fit the overall grand style of the Hollywood culture. 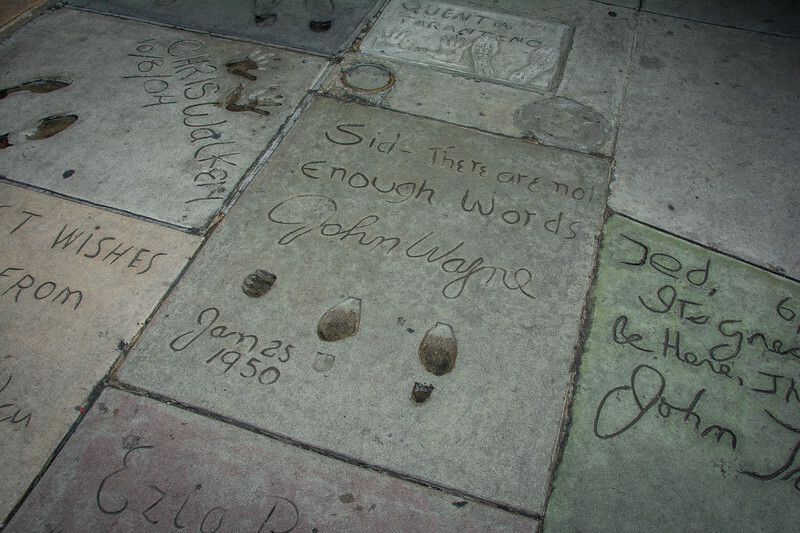 As you admire some of the prints left by your favorite movie stars, you can’t help but notice many comments referencing a certain “Sid.” This is referring to Sid Grauman, the original creator of the Grauman Chinese Theatre. 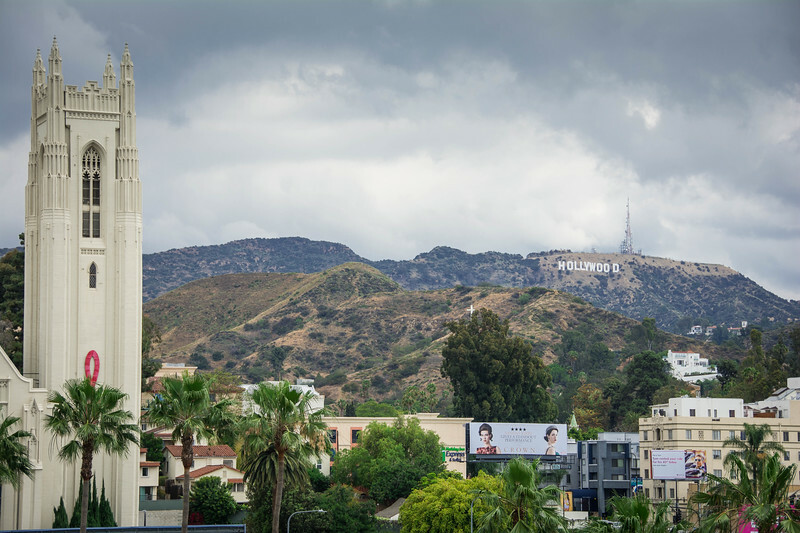 We have highlighted just a few of the best things to do around Hollywood but with the Griffith Observatory, Sunset Ranch Hollywood, several museums and of course, a plethora of shops to keep you occupied for days, there is plenty more to see and experience. Welcome to Hollywood! The beauty of visiting this area of Los Angeles is that it provides a unique neighborhood unlike anywhere else in the world. 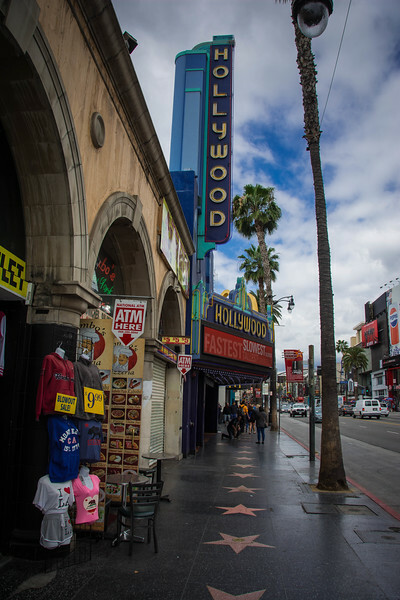 We highly recommend everyone checking out Hollywood and staying at the iconic “Hollywood Hotel,” as this not only gives you the perfect opportunity to explore this neighborhood, the ease of access to the LA Metro line allows you the chance to experience many other areas of the city. If you are planning a visit to Hollywood, I want to emphasize that taking public transportation or walking is the best way to get around. Not only is traffic crazy but parking can be difficult and extremely expensive. 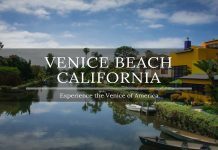 Neighborhoods such as Santa Monica, Venice Beach, Beverly Hills and downtown LA are all easily accessible from Hollywood. 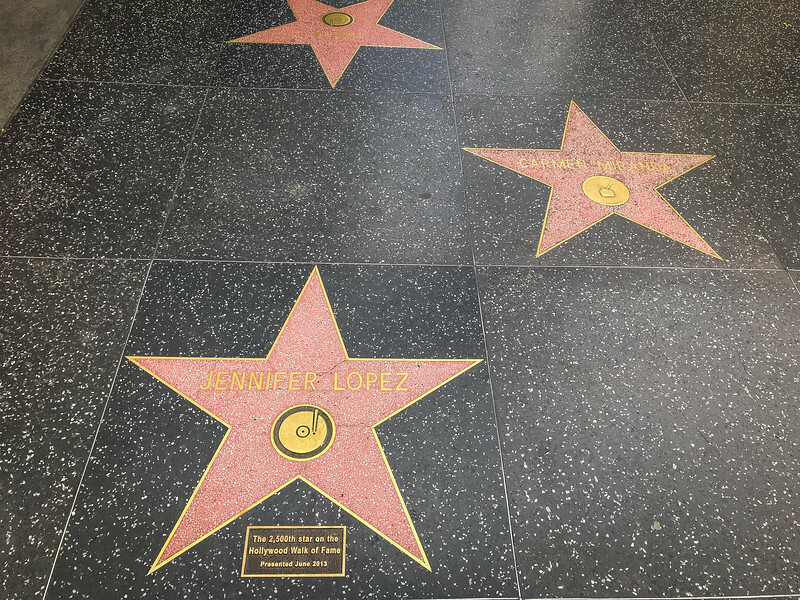 Can you think of anything better than taking a stroll along the Hollywood Walk of Fame and finding your favorite actors’ stars? It’s a pretty surreal experience to know that you are walking along a street where so many famous people have stood to commemorate their star. 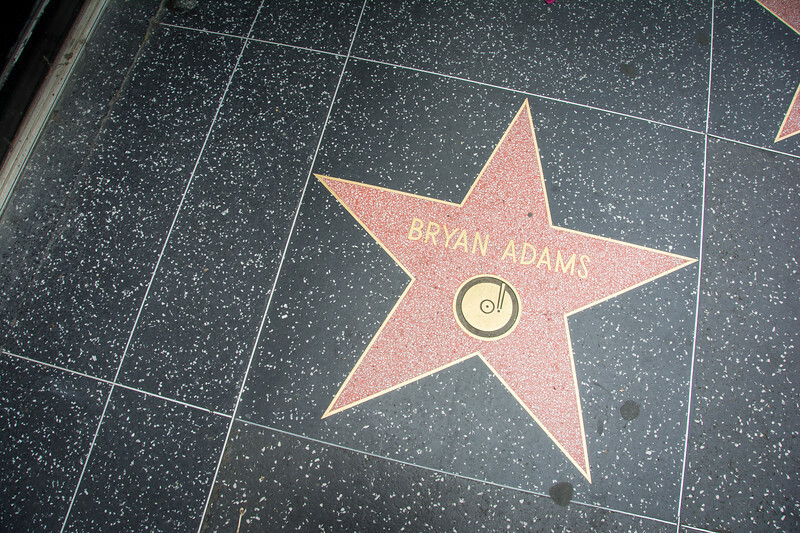 Perhaps you will be the next aspiring star to get your name printed on Hollywood Boulevard! Totally understand what you mean on the car Chris. I have spoken to enough folks who traveled to LA, the home of perhaps the worst traffic on earth. People spend hours sitting in traffic, trying to travel a few miles. 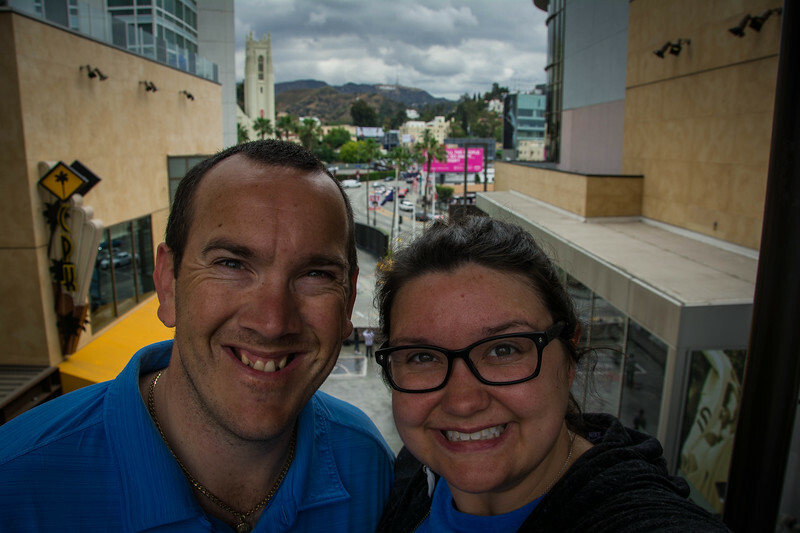 Skip the bar, stay in a rocking hotel and walk around town to do LA right. Fabulous post guys. “Amazing” Hollywood a place where lots of people go to full fill their dreams. but some of them go to explore the beauty of Hollywood. hollywood has fame all over the world because of that when anyone goes their he/she always click a pic with Hollywood sign. That hotel looks amazing – love the courtyard area and those breakfast bagels look amaaaazing. I didn’t personally think much of Hollywood – I didn’t have time to to hike to the sign but the actual Walk of Fame and so on was a little overhyped in my eyes. Still, somewhere that’s definitely worth seeing on any visit to the city! Great Post, hope you enjoyed a lot. Thanks for sharing this post.